The album deviates from the more socially conscious style which Dylan had developed with his previous LP, "The Times They Are a Changin'". The change prompted criticism from some influential figures in the folk community – Sing Out! editor Irwin Silber complained that Dylan had "somehow lost touch with people" and was caught up in "the paraphernalia of fame". Despite the album's thematic shift, Dylan performed the entirety of "Another Side of Bob Dylan" as he had previous records – solo. In addition to his usual acoustic guitar and harmonica, Dylan provides piano on one selection, "Black Crow Blues". Another Side of Bob Dylan reached No. 43 in the US (although it eventually went gold), and peaked at No. 8 on the UK charts in 1965. Throughout 1963, Dylan worked on a novel and a play. A number of publishers were interested in signing Dylan to a contract, and at one point, City Lights (a small but prestigious company specializing in poetry) was strongly considered. However, as Dylan worked on his book at a casual pace, his manager, Albert Grossman, decided to make a deal with a major publisher. Macmillan's senior editor, Bob Markel, said, "We gave [Dylan] an advance for an untitled book of writings … The publisher was taking a risk on a young, untested potential phenomenon." When Markel met with Dylan for the first time, "there was no book at the time … The material at that point was hazy, sketchy. The poetry editor called it 'inaccessible.' The symbolism was not easily understood, but on the other hand it was earthy, filled with obscure but marvelous imagery … I felt it had a lot of value and was very different from Dylan's output till then. [But] it was not a book." This refrain would soon appear in a very important composition, "Chimes of Freedom", and, as biographer Clinton Heylin writes, "with this sad refrain, Dylan would pass from topical troubadour to poet of the road." In February 1964, Dylan embarked on a twenty-day trip across the United States. Riding in a station wagon with a few friends (Paul Clayton, Victor Maymudes, and Pete Karman), Dylan began the trip in New York, taking numerous detours through many states before ending the trip in California. (At one point, Dylan reportedly paid a visit to poet Carl Sandburg.) "We talked to people in bars, miners," Dylan would later say. "Talking to people – that's where it's at, man." According to Heylin, "the primary motivation for this trip was to find enough inspiration to step beyond the folk-song form, if not in the bars, or from the miners, then by peering deep into himself." Dylan spent much time in the back of the station wagon, working on songs and possibly poetry on a typewriter. It was during this trip that Dylan composed "Chimes of Freedom", finishing it in time to premiere at a Denver concert on the 15th. "Mr. Tambourine Man" was also composed during this trip. It was also during this trip that the Beatles arrived in America. Their first visit to the United States remains a touchstone in American culture. Maymudes recalled how Dylan "nearly jumped out the car" when "I Wanna Hold Your Hand" came on the radio and his comments: "Did you hear that?..that was great! Oh man.." and how Dylan seemed lost in thought replaying the record over in his head. Dylan, however, had already been following the Beatles since 1963. There have been different accounts regarding Dylan's attitude towards the Beatles at this time, but it's known that Suze Rotolo and Al Aronowitz immediately took to them and championed their music to Dylan. Aronowitz later claimed that Dylan dismissed them as "bubblegum", but in an interview in 1971, Dylan recalls being impressed by their music. "We were driving through Colorado, we had the radio on, and eight of the Top 10 songs were Beatles songs … 'I Wanna Hold Your Hand,' all those early ones. They were doing things nobody was doing. Their chords were outrageous, just outrageous, and their harmonies made it all valid … I knew they were pointing the direction of where music had to go." When Dylan returned to New York in March, he rented an electric guitar. In January, the Beatles were in France, playing a week's worth of concerts. During their stay in France, George Harrison came back to the hotel with an album titled "En Roue Libre", better known as "The Freewheelin' Bob Dylan". According to Harrison, "we just played it, just wore it [out]. The content of the song lyrics and just the attitude!" (While "The Freewheelin' Bob Dylan" was released in the UK in August 1963, the French edition En Roue Libre was not released until May 1965 so it was likely the UK release). As the Beatles began to influence Dylan and vice versa, Dylan's personal life was undergoing a number of significant changes. Though their stage appearances together began to dwindle, Dylan continued his romance with folksinger Joan Baez. Dylan's girlfriend Suze Rotolo apparently had had enough of the affair. Soon after Dylan returned to New York, the two had an argument. At the time, Suze was staying with her sister Carla, and when Carla intervened, Dylan began screaming at Carla. Carla ordered Dylan to leave, but he refused to go. Carla Rotolo pushed Dylan, and he pushed her back. The two of them were soon practically fighting. Friends were called and Dylan had to be forcibly removed, effectively ending his relationship with Suze Rotolo. In a 1966 interview, Dylan admitted that after their relationship ended, "I got very, very strung out for a while. I mean, really, very strung out." One account of Dylan's first experience with psychedelics places it in April 1964; producer Paul Rothchild told Bob Spitz that he was present when Dylan took his first hit of LSD. By February 1964, Dylan was already telling his friends that "Rimbaud's where it's at. That's the kind of stuff means something. That's the kind of writing I'm gonna do." A nineteenth-century French poet, Rimbaud once wrote to his mentor Georges Izambard that "the poet makes himself a seer by a long, prodigious and rational disordering of the senses … He reaches [for] the unknown and even if, crazed, he ends up by losing the understanding of his visions, at least he has seen them." (Dated May 1871) Dylan's early experimentation with hallucinogens has often been connected with the dramatic development his songwriting would soon take, but Dylan himself has denied any connection. Dylan later left for Europe, completing a few performances in England before traveling to Paris where he was introduced to a German model, Christa Paffgen, who went by the name of Nico. After treating Dylan to a meal at her flat, Nico accompanied Dylan across Europe, a trip that passed through Germany before ending in Vernilya, a small village outside of Athens, Greece. Dylan stayed at Vernilya for more than a week, finishing many of the songs that would appear on his fourth and upcoming album. Nine songs of these would be recorded upon his return to New York: "All I Really Want to Do", "Spanish Harlem and "Black Crow Blues". Dylan also completed another song called "I'll Keep It With Mine", which, according to Nico, was "about me and my little baby". Dylan gave the song to Nico, who would eventually record it for her own album, "Chelsea Girl", released in 1967. With Dylan's commercial profile on the rise, Columbia was now urging Dylan to release a steady stream of recordings. Upon Dylan's return to New York, studio time was quickly scheduled, with Tom Wilson back as producer. The first (and only) session was held on June 9 at Columbia's Studio A in New York. According to Heylin, "while polishing off a couple of bottles of Beaujolais", Dylan recorded fourteen original compositions that night, eleven of which were chosen for the final album. The three that were ultimately rejected were "Denise Denise", "Mr Tambourine Man", and "Mama, You Been On My Mind". Ramblin' Jack Elliott was present during part of this session, and Dylan asked him to perform on "Mr. Tambourine Man". "He invited me to sing on it with him," recalls Elliott, "but I didn't know the words 'cept for the chorus, so I just harmonized with him on the chorus." Only one complete take was recorded, with Dylan stumbling on some of the lyrics. Though the recording was ultimately rejected, Dylan would return to the song for his next album. By the time Dylan recorded what was ultimately the master take of "My Back Pages", it was 1:30 in the morning. Master takes were selected, and after some minor editing, a final album was soon sequenced. 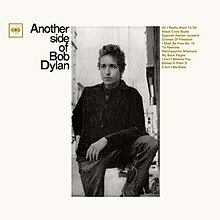 As Dylan told Nat Hentoff in The New Yorker, "there aren't any finger-pointin' songs" on "Another Side of Bob Dylan", which was a significant step in a new direction. "As a set, the songs constitute a decisive act of noncommitment to issue-bound protest, to tradition-bound folk music and the possessive bonds of its audience," writes music critic Tim Riley. "The love songs open up into indeterminate statements about the emotional orbits lovers take, and the topical themes pass over artificial moral boundaries and leap into wide-ranging social observation." "Chimes of Freedom" can be traced to "Lay Down Your Weary Tune", an outtake from "The Times They Are-A Changin'". "Its sense of the power of nature...closely mirrors 'Lay Down Your Weary Tune,'" writes Clinton Heylin. "Unashamedly apocalyptic … the composition of 'Chimes of Freedom' represented a leap in form that permitted even more intensely poetic songs to burst forth." "The compassion that laces all the complaints in 'All I Really Want to Do' and 'It Ain't Me, Babe' is round with idealism and humor," writes Riley. "That [both songs] work off a pure Jimmie Rodgers yodel only makes their ties to wide-open American optimism that much more enticing (even though they are both essentially reluctant good-byes)." "It Ain't Me Babe" also reworks the same "Scarborough Fair" arrangement that was written into Dylan's earlier compositions, "Girl from the North Country" and "Boots of Spanish Leather". Johnny Cash would record his own hit version of this song soon after "Another Side of Bob Dylan" was released, while The Turtles' version would chart even higher. According to Heylin, "Ballad in Plain D" takes its melody and refrain ("my friends say unto me …") from the Scottish folk song, "I Once Loved A Lass (The False Bride)". "The song graphically details the night of his breakup with Suze," writes Heylin. "Dylan's portrayal of Carla as the 'parasite sister' remains a cruel and inaccurate portrait of a woman who had started out as one of [Dylan's] biggest fans, and changed only as she came to see the degrees of emotional blackmail he subjected her younger sister to." Asked in 1985 if there were any songs he regretted writing, Dylan singled out "Ballad in Plain D", saying "I look back at that particular one and say … maybe I could have left that alone." "'Spanish Harlem Incident" is a new romance that pretends to be short and sweet," writes Riley, "but it's an example of how Dylan begins using uncommon word couplings to evoke the mysteries of intimacy … her 'rattling drums' play off his 'restless palms'; her 'pearly eyes' and 'flashing diamond teeth' off his 'pale face.'" Described by Heylin as "the most realized song on Another Side", "To Ramona" is one of the most celebrated songs on the album. A soft, tender waltz, Riley writes that the song "extends the romance from ideals of emotional honesty out into issues of conditioned conformity ('From fixtures and forces and friends / That you gotta be just like them') … in 'Spanish Harlem Incident,' [Dylan's] using flattery as a front for the singer's own weak self-image; in 'To Ramona,' he's trying to save his lover from herself if only because he knows he may soon need the same comfort he's giving her." Described by Riley as "the unalloyed sting of a romantic perfidy", "I Don't Believe You (She Acts Like We Never Have Met)" would be dramatically rearranged for a full-electric rock band during Dylan's famous 1966 tour with The Hawks. Four songs from "Another Side of Bob Dylan" were eventually recorded by The Byrds: "Chimes of Freedom", "My Back Pages", "Spanish Harlem Incident", and "All I Really Want to Do". In addition, they were introduced to their breakthrough hit single "Mr. Tambourine Man" through a copy of Dylan's unreleased recording from the June 9, 1964 album session. All received their share of critical acclaim. As Another Side of Bob Dylan was prepared for release, Dylan premiered his new songs at the Newport Folk Festival in July 1964. The festival also marked Dylan's first meeting with Johnny Cash; Dylan was already an admirer of Cash's music, and vice versa. The two spent a night jamming together in Joan Baez's room at the Viking Motor Inn. According to Cash, "we were so happy to [finally] meet each other that we were jumping on the beds like kids." The next day, Cash performed Dylan's "Don't Think Twice, It's All Right" as part of his set, telling the audience that "we've been doing it on our shows all over the country, trying to tell the folks about Bob, that we think he's the best songwriter of the age since Pete Seeger...Sure do." Though the audience at Newport seemed to enjoy Dylan's new material, the folk press did not. Irwin Silber of Sing Out and David Horowitz criticized Dylan's direction and accused Dylan of succumbing to the pressures/temptations of fame. In an open letter to Dylan published in the November issue of Sing Out, Silber wrote "your new songs seem to be all inner-directed now, inner-probing, self-conscious" and, based on what he saw at Newport, "that some of the paraphernalia of fame [was] getting in your way." Horowitz called the songs an "unqualified failure of taste and self-critical awareness." The album was a step back commercially, failing to make the Top 40, indicating that record consumers may have had a problem as well. Dylan conceded in 1978 that the album title was not to his liking. "I thought it was just too corny," he said, "I just felt trouble coming when they titled it that." However, it's worth noting that the original manuscripts to the album make two references to the eventual album title: an early draft of "I Shall Be Free No. 10" has the line "You're on another side" while the only line occupying one final page says "there is no other side of bob dylan." This record is a early 1970's pressing.